Description Display prop only - the bicycle is not practial. These are better know as the \"high wheelers\". It is more comfortable to ride than its predecessor, but it requires an acrobat so they popularity has always been limited. This was the first all metal machine to appeared. (Previous to this metallurgy was not advanced enough to provide metal which was strong enough to make small, light parts out of.) The pedals were still attached directly to the front wheel with no freewheeling mechanism. Solid rubber tires and the long spokes of the large front wheel provided a much smoother ride than its predecessor. The front wheels became larger and larger as makers realized that the larger the wheel, the farther you could travel with one rotation of the pedals. You would purchase a wheel as large as your leg length would allow. These bicycles enjoyed a great popularity among young men of means (they cost an average worker six month\'s pay), with the hey-day being the decade of the 1880\'s. Because the rider sat so high above the center of gravity, if the front wheel was stopped by a stone or rut in the road, or the sudden emergence of a dog, the entire apparatus rotated forward on its front axle, and the rider, with his legs trapped under the handlebars, was dropped unceremoniously on his head. Here the term \"taking a header\" came into being. 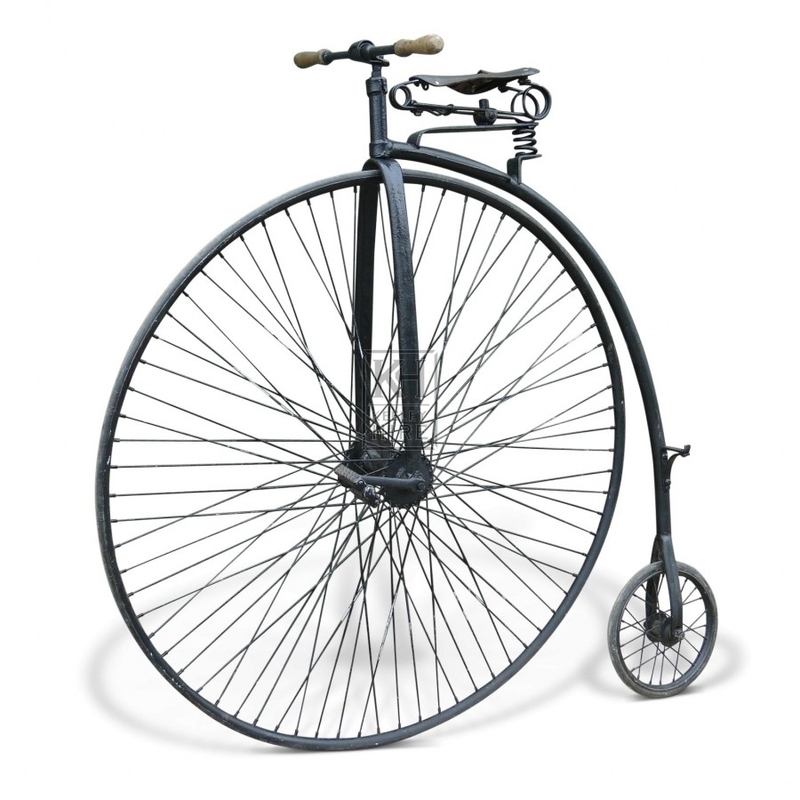 This machine was the first one to be called a bicycle (\"two wheel\").